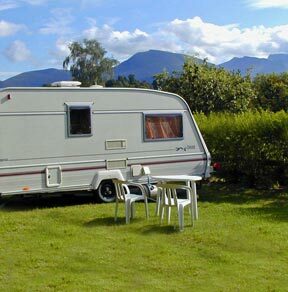 We have fifteen pitches for touring caravans, campervans and tents. This area has a modern toilet block with showers, hot water, elsan disposal and a separate dish wash point. There are also eighteen electric hook up points. Pitched here for 4 nights on our tour of the Scottish Highlands. Found the place by accident but glad we did. Fantastic views and good amenities, we have already recommended it to our friends!